The Global Educator of the Year Award recognises educators who have gone above and beyond in raising awareness and deepening understanding of the UN’s Sustainable Development Goals (SDGs) and encouraging people to take action. 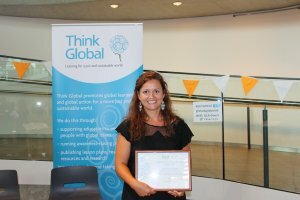 We are delighted to announce the winner of the 2018 Global Educator of the Year Award – Samantha Olubodun. The Award was celebrated at a special event in City Hall, London on 13 July. We had an inspirational line-up of finalists this year. Our congratulations to all our GEYA 2018 finalists – Samantha Olubodun (Meadow County Primary School, Cheshire), Thandiwe Banda, (Overton Grange School, Surrey) and Jo Fraser, (Beaconhurst School, Stirling). 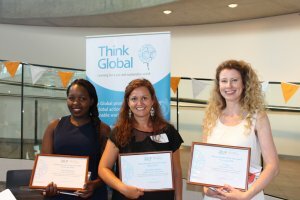 All of our finalists were recognised for their work in raising awareness and deepening understanding of the UN’s Sustainable Development Goals (SDGs) and doing remarkable work in creating future global citizens. Read more about our winner Samantha Olubodun and the work of our GEYA finalists. Find out more about the 2018 event. Find out more the 2017 Award.